The inverted yield curve is arguably the single most powerful and accurate predictor of recession. Since 1955, shorter-dated bonds have had higher yields than longer-dated bonds nine times. This phenomenon has accurately predicted an ensuring recession all of those nine times. One of the primary problems with an inverted yield curve is that it means banks are paying out higher interest rates on savings (short term rates) than they are making on the loans (like mortgages) they’re issuing (long term rates). So they stop making those loans, and in our debt-driven economy, there are few better ways to choke off economic growth than sharply curtailing bank lending. It if looks like a duck, waddles like a duck, and quacks like a duck, it’s probably a duck. 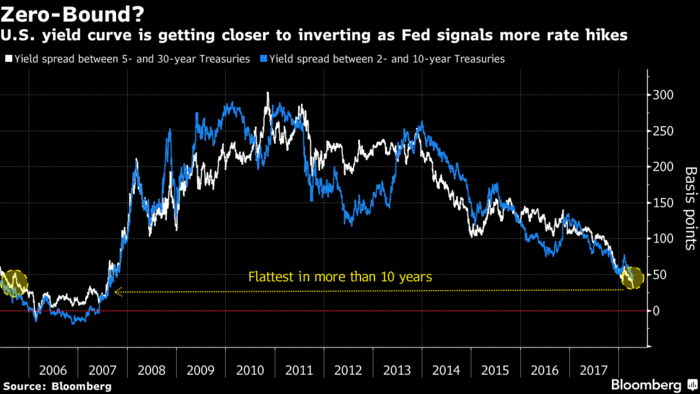 And if the yield curve inverts, as it’s well on its way to doing, it will probably herald the same coming recession that it has always heralded before. Objective market strategists understand that the yield curve will soon invert and the ramifications of such an event will be the same as they always have been in the past. The only difference being that this next financial crisis will bring about a protracted global recession/depression. This is because the bursting of the gargantuan bond bubble is occurring in the context of aggregate debt levels and asset valuations that are far greater than at any other time in history. The Main Stream Financial Media gives a voice to stock market cheerleaders with alacrity. Nevertheless, they are leading investors astray just as they did prior to the NASDAQ implosion in 2000 and the Great Recession of 2008. Those are the last two occasions when the yield curve inverted and caused investors to lose most of their retirement nest egg. But that doesn't mean you have to be a victim yet again.